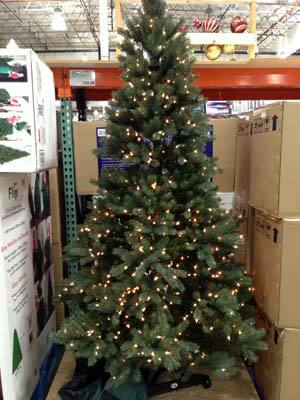 It’s that time of year again and Costco’s selection of 2012 Christmas trees is top notch. 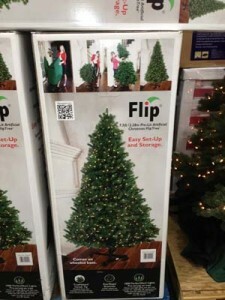 There are artificial Christmas trees that are pre-lit, as well as fresh cut Christmas trees sold in some Costco parking lots. As you can see in my 2011 review of my Costco artificial Christmas tree, I really like their trees. They are very easy to set up, look gorgeous, and are well priced. Meanwhile, the fresh trees are usually the best price in town and the best looking, if you can get one before they’re gone. Check out my post on the fresh cut trees for more information. The color choice tree is very interesting. In fact, I’ve never seen a tree like it before. The lights can change from white to colored with a switch, and you can also have it alternate every second or so, which I could imagine would be very annoying in a living room. One difference between 2012’s trees and 2011’s is that these trees are LED, whereas last year’s wasn’t. Also, last year they had a 9.5′, whereas this year it’s 9′. I believe last year’s trees were Colorado Spruce, whereas this year’s is Evergreen. You can see what the trees look like in my videos below. For the second year in a row I have missed on the 9′ artificial christmas tree — any idea when they make them available on line? Hi, what is the difference between the first 7.5 tree you listed with 1000 lights for 249 & the flip tree? What does flip mean? Thank you!